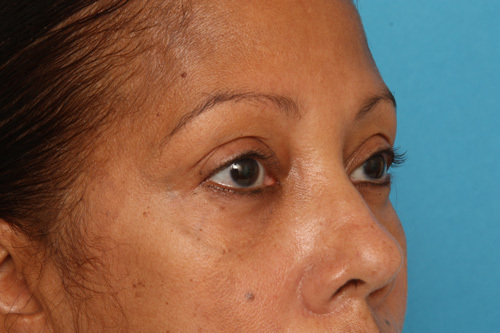 ASPS Presentations: Lower Eyelid Blepharoplasty - Patrick Sullivan, M.D. Recently, Dr. Patrick Sullivan took part in the annual American Society of Plastic Surgeons (ASPS) meeting, where he moderated and presented several educational sessions. These sessions included topics on surgical and non-surgical facial rejuvenation, the neck lift, the browlift, and lower eyelid surgery (blepharoplasty). Among Dr. Sullivan’s presentations was a talk entitled “Techniques and Avoiding Complications in Lower Lid Blepharoplasty.” Dr. Sullivan was asked to present his own technique, which he personally developed over ten years ago. It is a treatment based on research of techniques used by other doctors and laboratory studies done by Dr. Sullivan. Dr. Sullivan has now done over 400 of these lower eyelid and cheek procedures. When performing eyelid surgery, Dr. Sullivan utilizes an internal incision that goes inside the lower eyelid and is designed to provide minimal scarring by avoiding external incisions of the skin as much as possible. Through this internal incision, he can rejuvenate the appearance of the eyes by removing puffy bags and taking away under eye circles. This can often be very beneficial for people who are being told they “look tired”. To decrease the risk of complications, Dr. Sullivan routinely uses lower eyelid support to keep the lower eyelid in the natural place and therefore avoid an abnormal lower eyelid position that may appear surgical. Dr. Sullivan presented a classification system to demonstrate how his technique can be used to solve a variety of patient problems. Over the years, Dr. Sullivan has seen many patients outside of his practice complain of unnecessary scarring, unnatural-looking results and post-surgery complications. Through educating surgeons, Dr. Sullivan hopes to decrease the prevalence of these negative outcomes that can occur with lower eyelid surgical techniques. To learn more about his advanced techniques, please feel free to contact us today for more information, or to schedule a consultation. 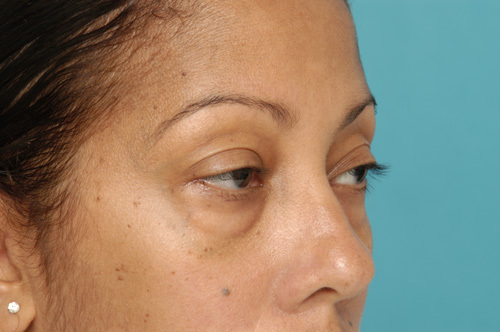 This is a 46 year old woman who is concerned about a “tired appearance” that she felt was related to the puffiness and circles around her eyes. Dr. Sullivan treated her with his specialized extended blepharoplasty technique to address both the puffiness and the circles. Hidden internal incisions were used to avoid the appearance of any external scars. On the right is a 7 year follow up photograph.